First launched by the model extraordinaire into the UK in 1997, the brand described as being for “Women with Skin of Color” are introducing a new mineral liquid foundation to its range of base products. The range already consists of powder and cream bases, so a liquid option just in time for Summer completes the set nicely. IMAN Luxury Radiance Liquid Makeup Enriched with Minerals (£23.95) offers a sheer-to-medium coverage and comes in 8 shades. According to the IMAN Cosmetics website, the shade range begins at around a MAC NC35/44 so as you might expect, none of these shades are intended to come close to catering for a woman of clearlynocolouratall like me but I’m sure there’ll be useful swatches-a-plenty appearing soon on WOC-friendly blogs for you to feast your eyes upon! The Eye-Con Kit… a cute enough set but has the line’s packaging seen an update since the 90s? The above two photos show IMAN’s hero bronzing product Afterglow which I can totally vouch is pretty much flippin’ stunning. See how those shades would easily work on all skintones? I was impressed with the subtle shimmer, delicate colour and soft texture. 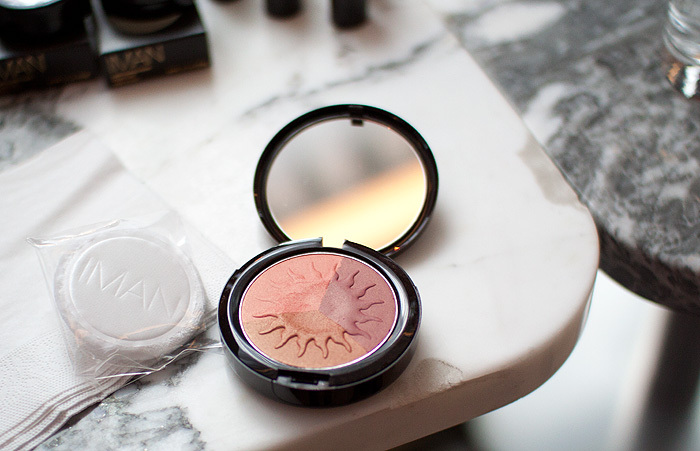 A beautiful bronzer indeed and one that I would definitely consider picking up. 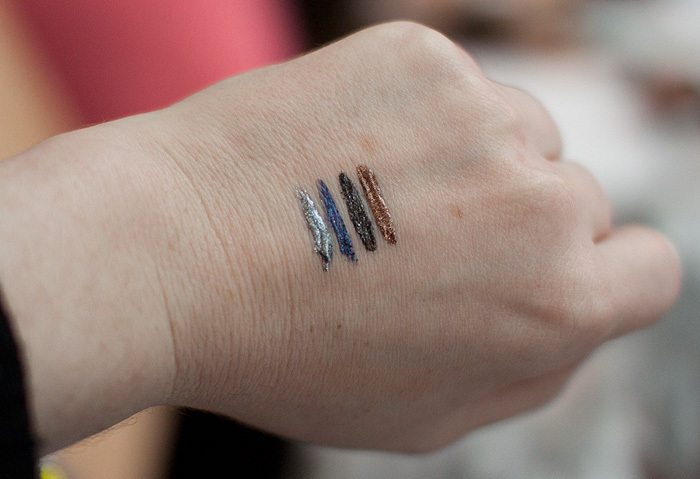 Four shimmering liquid eyeliners available from the brand’s Luxury Liquid Eyeliner range in Platinum, Sapphire, Onyx and Copper. 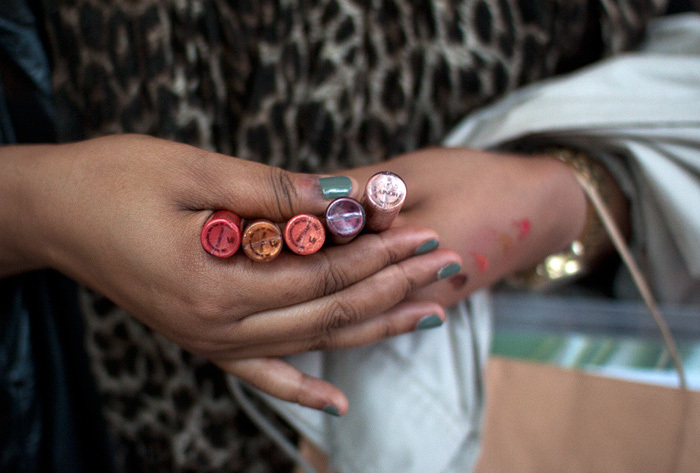 The pigmentation was good and as you can see, the colours are stunning. See that bottom shadow? I had a mild stroke when I saw its taupey goodness looking at me. Wicked is a shadow from their Luxury Eye Defining Powder range. I experienced virtually no fall out with this loose shadow and it glided on nicely pigmented. 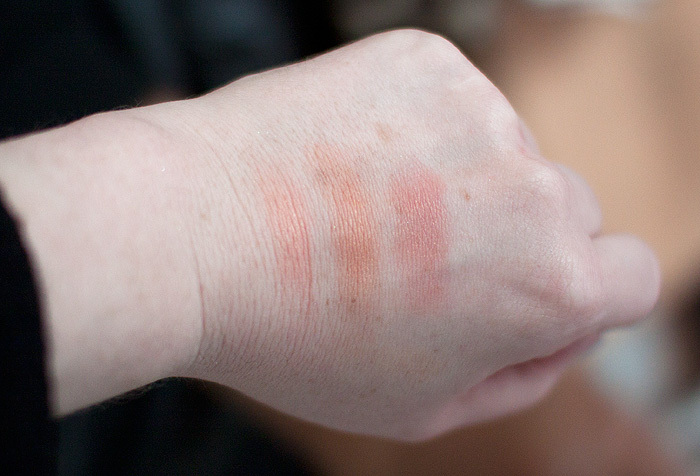 I wasn’t so keen on the lighter, golden shade swatched above which packed a lot less pigment by comparison. Luxury Lip Shimmers – I didn’t inspect these close up but judging by those swatches on Yinka’s hand… they pack a decent punch of colour! 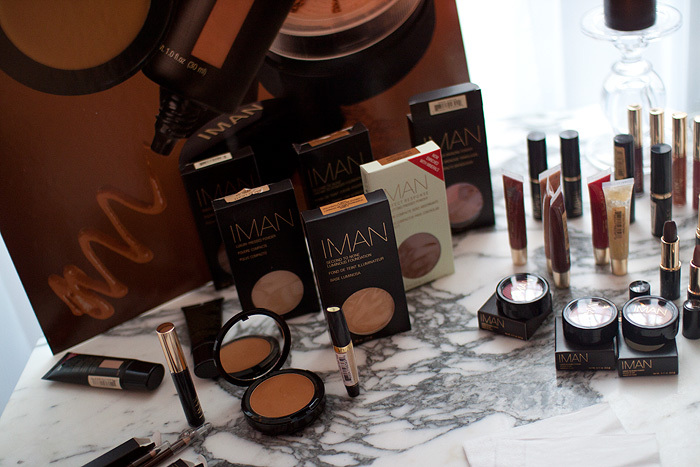 Now, at the moment… the IMAN Cosmetics range isn’t the easiest to come across. Infact, unless you live in London… you’re gonna struggle to access it until it makes its way online. Current stockists can be found by visiting the find-a-store page on the website. I heard about that brand though I’ve yet to see it at any of my local Targets. I really like the liquid liners! Those are amazing. The blue and copper liners were particularly pretty/multi dimensional! It is a high-end brand… I don’t have specific prices for all the items I’ve pointed out because a). the press release only covers the foundation and b). there is no online stock I could price reference it to. I think they need to get themselves online! Pardon me if this comment doesn’t make much sense but I’ve just finished tidying my room and I’m starving but I saw the tweet for this post on Twitter and I had to take a look. I thought the colours would be a little more pigmented but having said that the Afterglow looks nice and smooth and if there is one criticism I can make of certain brands that release pigmented items is that packing the pigment in sometimes seems to make the product chalky and crumbly. Regarding the shadows, I like the way that the pigment varies so that people of differing skintones can pick and choose which they like. I personally wouldn’t be able to pull of the taupe that you like but the middle colour is one I’d like to see more of. 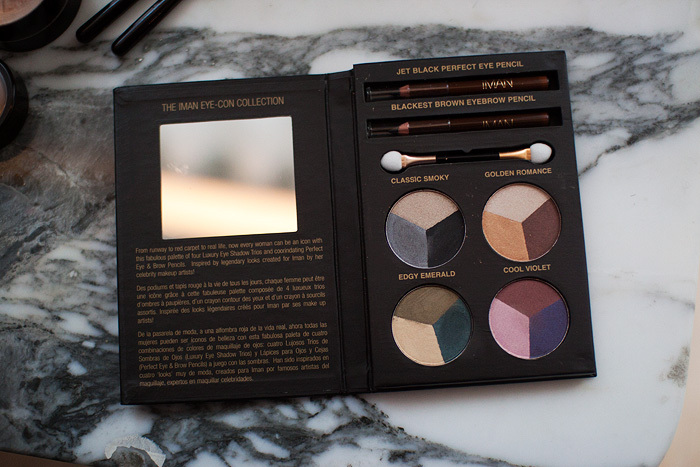 FINALLY (I bet you’re glad :P) the Eye-Con palette looks fantastic, you could just take that away with you for a week (I say could because you know I’d still haul around half of my makeup collection even if I had that)and have a different look every single day and evening. There were heaps of MUAs there and they were extolling the virtues of Afterglow particularly because it’s not uber heavy on the pigment. From the impression I got (being a nosy eavesdropper), it’s all about the glow it gives darker skin tones. I’m showing it kinda bastardised on my skin tone I guess but it was too pretty not to! 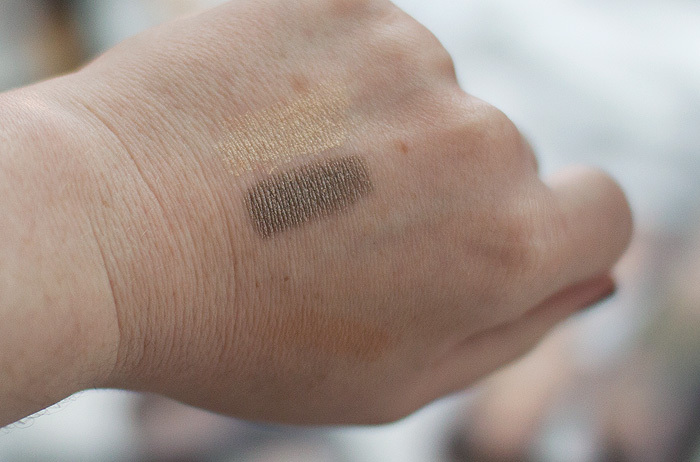 I should have swatched the EyeCon set to check pigment but didn’t…. still, next time you’re up at Westfield! Thank you for putting so eloquently into one line something I couldn’t say in my whole essay. That’s the kind of product I’m looking for (the Afterglow stuff) and it’s so hard to find sometihng that does that on my skin..imparts a decent sheen/glow without vanishing or being too heavy in pigment. I didn’t realise she sold in Beauty Base, I’m ALWAYS there divvying around. 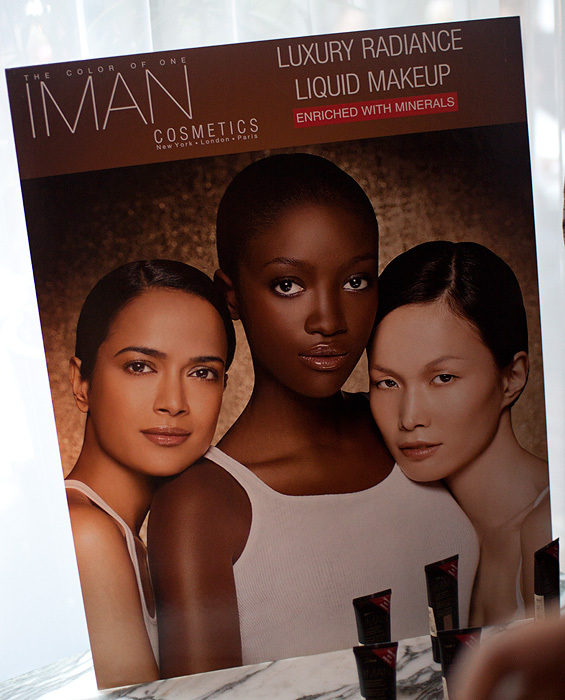 being an NC30-35, I’m interested to see that Iman caters for around my skin tone. I’ve had a lot of customers ask about Iman whilst working in cosmetics, but I’ve only ever known Beauty Base in Westfield to stock it, if you wanted to look at it hands on. 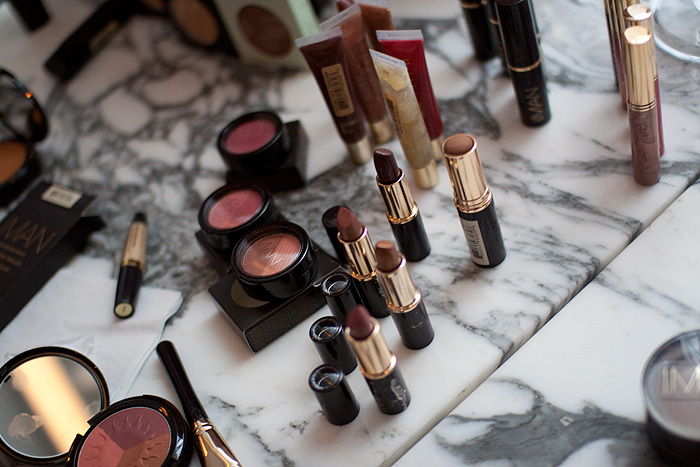 Looking at the “find a stockist” on the Iman site, looks like most if not all Beauty Bases do it. So are Iman having a comeback with more availability cos this looks like a press release party? The event was to promote the new Luxury Radiance Liquid Mineral Makeup which I talk about in the first paragraph. Just wanted to say how very much I appreciated the clever Bowie reference. Nicely done!